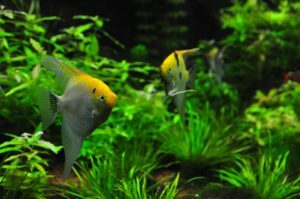 Before picking a filtration system for your aquarium, it’s best to understand how each stage of the filtration process works, so you can choose the right type of aquarium filter for your needs. Mechanical filtration’s primary function is to remove particulate from the water. This as achieved by forcing the water through the filter media. The media has to be porous enough to allow the water to flow through freely, but complex enough to trap any debris in the process. The types of media used to handle mechanical filtration include foam, floss and micron paper. In order for any mechanical filtration to function properly regular maintenance is necessary, in order to prevent the filter from becoming clogged. If the mechanical filtration media becomes clogged it can limit the filters performance. Another important part of maintaining your mechanical filtration media is to reduce the build up of toxic waste byproducts. As the filter captures particles this detritus slowly decomposes, releasing nitrates and ammonia into the water. 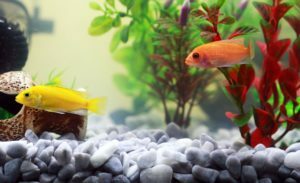 Even if the filter is still flowing freely, it’s best to change or clean the mechanical filtration media on a regular basis, for the health and longevity of your fish. While mechanical filtration is one of the simplest stages of the filtration process. Always be aware that the particles it captures have to be removed from the tank, and they should never be left to decompose. Making sure the mechanical filter media is as clean as possible, is one of the best ways to prevent any future filter failures. Chemical filtration provides the means to remove harmful and dangerous substances from an aquariums water. The simplest chemical filter is the activated carbon filter. When certain organic chemicals pass through the carbon filter they are captured in the many small voids in the filter. A carbon filter captures organic chemicals using a chemical bond. Following a proper replacement schedule is very important, since a chemical filter will no longer provide any benefit once it is fully saturated. In recent years other chemical filters have become available, like phosphate reducers, and filters that remove excess nutrients from the water. For the most part carbon filters are the most commonly used, and are found in most commercially available filters. Biological filtration is the process of converting dangerous ammonia and nitrite into less harmful nitrate. This is accomplished by colonies of bacteria that consume the more dangerous waste, and then excrete nitrates. The nitrates are safer for the fish, and they are very beneficial for plants. For a more in depth understanding of this process, we will have to think back to science class when we learned about the nitrogen cycle. 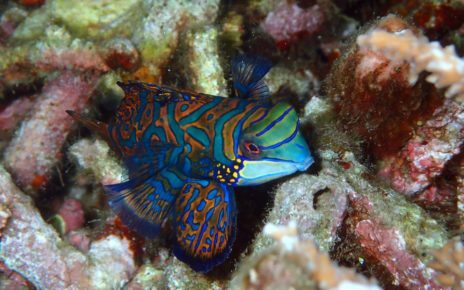 When your fish consume food and release the waste into the tank, that waste is primarily ammonia. Even the solid waste is broken down into ammonia by another group of bacteria. Once the ammonia is released into the water, an oxygen-loving bacteria called Nitrosomonas feeds on the ammonia. In the process the Nitrosomonas excrete nitrites as their waste product back into the water. Even though nitrites are less toxic to fish, they still can cause harm. This is where the next bacterial species in the nitrogen cycle takes over, Nitrobacter then converts the nitrites into relatively benign nitrates. 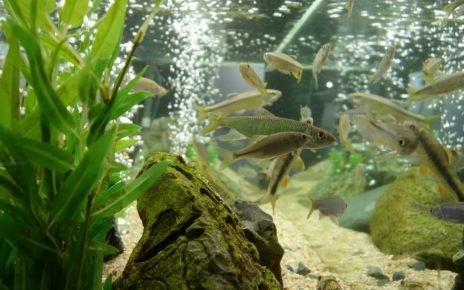 Nitrates can be very beneficial in a planted aquarium, since they provide the plants with much needed nitrogen. On the other hand in an aquarium with no plants, you will have to do regular water changes too keep the nitrate levels from becoming to elevated. Some of the problems associated with high nitrates levels, are algal blooms and the fish can be harmed if the levels get too high. 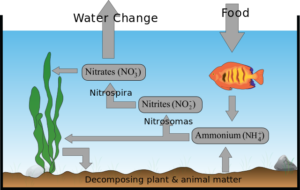 In order for the Nitrogen Cycle to take hold, there must be a suitable substrate for the bacteria to colonize. The bacteria also need an adequate supply of oxygen to convert ammonia into nitrites and nitrates. While biological filtration occurs to some degree on all surfaces in the aquarium and the filter, it’s best to provide a substrate with a high surface area for the bacteria to colonize. The gravel and rocks in an aquarium can also add some biological filtration capacity, depending on how porous the rocks are. In most cases filters provide a specifically designed area for biological filtration. These specialized stages have a high surface area for bacterial colonization. And they should also have sufficient exposure to oxygen for proper operation. These surfaces should never be cleaned with chlorinated water or any other chemicals, since that will kill the bacterial colonies and destroy the aquariums nitrogen cycle. 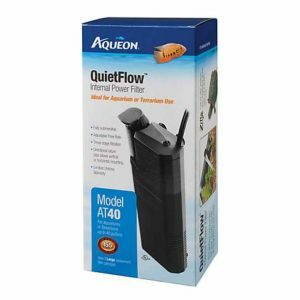 The most widely used filter for hobbyist aquariums is the power filter. They are mounted on the tank with the main filtration compartment hanging outside the aquarium. Power filters come with the pump and all necessary components built-in, making them a completely self contained drop in solution. They are usually very easy to maintain and provide excellent mechanical, chemical and biological filtration. Power Filters have easily replaceable filtration media that can be accessed from the top of the device. Being outside of the tank also allows for easy troubleshooting of any problems that may arise in the course of their daily operation. These filters are also widely available from a variety of manufactures and retailers, making it easy to find a filter that meets most peoples filtration needs. Mechanical filtration in a power filter is handled by a floss or foam filtration medium. In most cases floss filter material is less reusable and tends to be more prone to degradation. 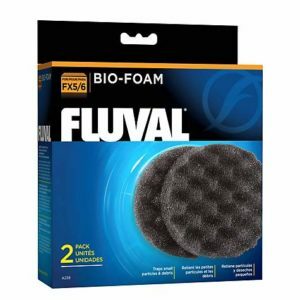 While foam filters can in some cases be cleaned and reused multiple times. In most power filters the mechanical stage can easily get clogged. This can lead to water bypassing the filter, by either going over or around it. The chance of having a clogged mechanical filter is dependent on the clarity of the water, and the number of fish in the aquarium. For this reason cleaning or replacing the mechanical filter should be assessed on a tank by tank basis. Chemical filtration in most power filters is usually handled by activated carbon filter media. Some power filters provide extra compartments for phosphate reducers, or other chemical filtration media. The activated carbon filters lifespan will depend on the organic biological load inside the aquarium. If the tank is heavily stocked, this will necessitate changing the activated carbon more often versus a lightly populated aquarium. An important point to consider before selecting a power filter, is that some manufacturers combine the mechanical and chemical stages into a single cartridge. This can make maintenance simple since you will have a single drop in replacement for the whole filter. On the other hand this will limit your ability to clean and reuse the mechanical filtration media. If you prefer doing some extra hand cleaning to extend the life of your filter media. Make sure before purchasing a power filter that it comes with separate mechanical and chemical media. Biological filtration is also handled inside the filter cartridge, because the bacteria will colonize the mechanical and chemical filtration media. While this will provide a good level of biological filtration, there are limits to this method. Since the cartridge is always submerged the bacteria will have less oxygen to break down any waste products. 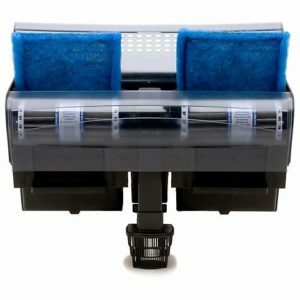 Another issue is when it comes time to replace or clean your filter cartridge, you will lose a significant portion of your filters bacteria colony. Which is another reason for having separate mechanical and chemical filtration media. In that case you can replace or clean one filter, while leaving the other alone. Doing filter changes this way will preserve the bacteria colony, and help with the colonization of the new filter. In most new power filters this issue has been addressed to some extent, by including specialized compartments with biological filtration substrates that don’t need to be replaced. The Bio-Wheel is one such specialized biological filtration method available on some power filters. Bio-Wheels function by passing the filters outlet water over a rotating water wheel. The wheel acts as a very efficient substrate for bacteria to colonize. Bio-Wheels also provide maximum oxygen availability for the bacteria. And they require minimal maintenance, so the bacteria can be left undisturbed during routine filter changes. There are a few cases where power filters should be avoided. 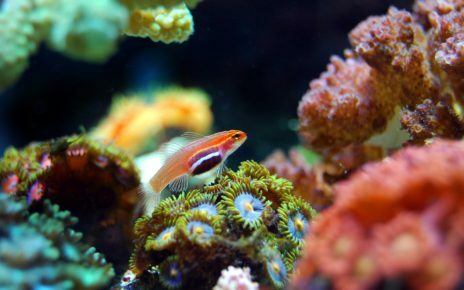 A power filter should not be used on a saltwater aquarium, since any excessive splashing can lead to salt splatter. The salt can then get under the hood of the tank which can cause damage to the lights and other equipment. 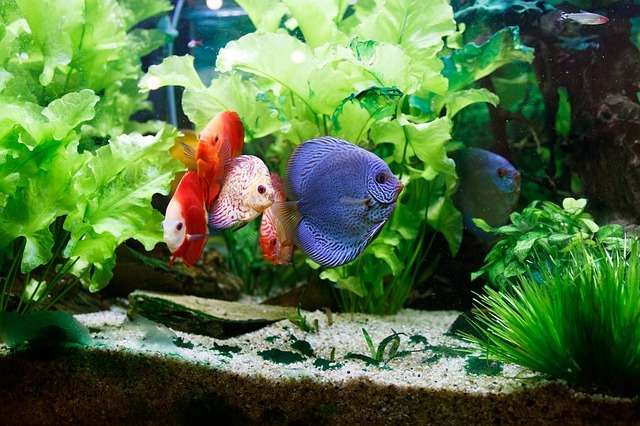 If you have a planted aquarium you should also avoid using a power filter, since they cause excessive water agitation. And this agitation can release carbon dioxide from the water. This can harm the plants in the aquarium, since they need the carbon dioxide to photosynthesize. In this case a power filter would not be the best choice. In this scenario another filter like an internal model should be considered as an alternative option. Another popular filter choice for an aquarium is the canister filter. They can be a little more complex to setup and manage, but can offer better filtration performance. Canister filters are an external filter and are usually placed in the stand or another out of the way place. A Canister filter can help increase the aesthetics of your tank, but they can make it a little harder to do certain maintenance tasks. Canister filters come in two main varieties. Either they come with a built in pump, or they are completely passive and just contain the filter media. If you already have a water pump, this can save you some money since a stand alone canister filter can be a less expensive option. Canister filters use two hoses to operate, one to pump water out of the tank and the other to return the water back to the tank. Since canister filters are usually placed some distance from the tank, they will require stronger water pumps to function efficiently. The increased pump pressure will enhance mechanical filtration efficiency. The pressure can be used to push water through a much finer filter material. When choosing mechanical filtration media for a canister filter, you can use filter media rated for particles as small as one micron. That means a canister filter can remove particles better than many other kinds of filters. Chemical filtration is also enhanced by the increased internal pressure of a canister filter. Since the chemical filter is under high pressure, the water can permeate all the voids available inside the filter media. This is a lot better than other low pressure systems where water can bypass some of the internal structure of the filter. Phosphate and other nutrient reducers are also more effective for this very same reason. Since the filter will be removing chemicals at a faster rate, the chemical filter media may have to be replaced more often. Canister filters are a completely closed pressurized system, so biological filtration is totally dependent on the dissolved oxygen in the water. Most canister filters contain a substrate for bacteria to colonize, these include ceramic, gravel or any other highly porous material. Since a canister filter has no access to atmospheric oxygen, they are sometimes paired with a wet/dry filter or a Bio-wheel. As long as sufficient oxygen is present, or supplemental bio filtration is provided, canister filters will do an adequate job of bio filtration. Canister filters are also widely available in a range of sizes and configurations, and they tend to be in the middle to high price range. They are a great choice for those who have unique aquarium configurations. Planted aquariums will work well with a canister filter, since the return water line can be placed in the water, which can minimize carbon dioxide loss. Also since planted aquariums require less biological filtration, you can get away with using a canister filter exclusively in those situations. Canister filters are also perfect for custom reef aquariums. If you already have a wet/dry filter or a refugium, adding a canister filter can increase overall water quality with minimal changes. The wet/dry filter is usually used on large fresh and saltwater aquariums. The wet/dry system is comprised of two main components, the overflow box and the filtration unit. The overflow box is located inside the aquarium, and it serves the function of supplying the filter unit with water. The overflow system itself is made up of two compartments. One of the compartments is inside the tank, and the other one is connected to the first but remains outside of the aquarium. The water level which controls the overflow process is driven by the return pump, which is located in the wet/dry filters sump. When the water level reaches a certain point inside the first compartment of the overflow box, the water then flows out into the second compartment. This water then supply’s the main wet/dry filter with water via the connected plumbing. Another nice feature is that the water level of the tank can be controlled by making adjustments to the overflow system. Once the water is on it’s way to the main filter unit, it is first passed through a porous sponge media. The sponge filter removes any large particulate before it enters the biological filtration compartment. Water is then dripped or sprayed onto the biological filtration media. After the water passes through the biological filter it settles in the sump portion of the filtration unit, and is returned to the tank via a submersible pump. Mechanical filtration in a wet dry setup is provided solely by the sponge filter. The sponge removes large debris from the water before it can foul up the biological filter. Due to the fact the wet/dry filter operates using an overflow system, the sponge must be very porous so as not to restrict the flow of water entering the filter. If the sponge restricts the flow of water too much it could cause the aquarium to overflow, or it could lead to the sump running dry. For these reasons the mechanical filtration provided by a wet dry filter is inherently limited. Chemical filtration can be supplied in a wet/dry system by adding specially designed chemical filter media. If you add chemical filter media to the main filter unit, the chemical filtration process is limited. This is mainly due to the water only being trickled over the chemical filter media. If on the other hand you add a canister filter on the return line, you can provide very efficient chemical filtration to a wet/dry system. Biological filtration is where wet/dry filters really excel. This is due to the large surface area of the biological substrate. And the unfettered access to oxygen this kind of filter provides. In most wet dry systems Bio-Balls are used as the filter media. These plastic balls have channels and grooves molded into them in order to increase their overall surface area. Other kinds of media such as ceramic or rock can also be used in the filter. And specially designed activated carbon Bio-Balls are also available. A Wet/Dry system will provide the best biological filtration of any type of filter, as long as it is properly sized to meet the bio-load inside the aquarium. Another place where a wet/dry system should not be used is in a planted tank. The reason for this is that the biological filter is completely exposed to the air, which will cause a huge carbon dioxide loss inside this kind of system. The exposed filter media can also lead to increased evaporation which could be undesirable in certain conditions. Wet/dry filters are perfect for large complex aquariums where custom plumbing and multi-stage filtration are the norm. While most commonly found in large saltwater setups, wet/dry systems are also very effective in freshwater aquariums. Since a wet/dry system requires more skill and space to operate, they are not commonly used by beginners or hobbyists. As with all filtration systems wet/dry filters have their pluses and minuses, but if you are going to run a large aquarium with a high stocking density, nothing really compares to a wet/dry filter. Similar to external power filters, these units are complete self contained systems. Internal power filters utilize a built in pump and filter media to treat the water in an aquarium. They can be used in locations where external power filters either won’t fit, or where they would be deemed unattractive. They also have the added benefit of being very quiet, and they are not prone to splashing like external power filters. Mechanical filtration is handled either by floss or foam media. Foam media is usually the preferred type of media used in most internal power filters. Internal power filters also tend to have smaller filter cartridges than external power filters. The small filter size is due to the internal power filter itself being smaller than a regular power filter. The smaller filter cartridges will necessitate more frequent filter maintenance. Chemical filtration is usually handled by activated carbon. 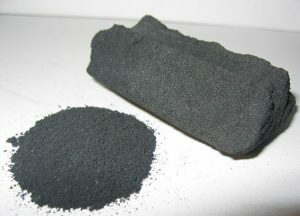 The activated carbon is usually incorporated into the mechanical filtration cartridge. This means that when one part of the filter needs to be changed you will have to change them both. Since the activated carbon has to fit into an already small filter cartridge, it can limit the effectiveness of the chemical filter. Biological filtration will also be somewhat impaired when using an internal power filter. 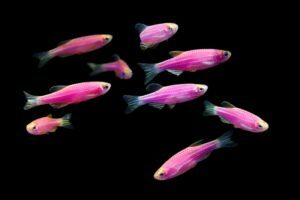 The real limit on the biological filter is the oxygen in the aquariums water. Placing the power filter closer to the water surface can provide more oxygen which will enhance biological filtration. As with any filter where both the mechanical and chemical filters are replaced at the same time, significant bacterial loss can occur. Some internal power filters use a two cartridge system, which can help alleviate this concern. Though in most smaller units only one cartridge slot is provided. Given these limitations, care should be taken when replacing the filter media. 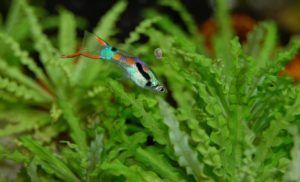 While internal power filters might sound like a compromise on most fronts, there are situations were they are a very good fit, One of those being in a planted tank. Since they don’t disturb the surface of the water very much, they will help keep carbon dioxide in the water. And their weakness in biological filtration is not as much of an issue, since the plants will provide excellent biological filtration in most cases. Another good use for an internal power filter is supplemental filtration. This is especially useful in a large tank that has many potential dead zones. These dead zones can arise if the main filter is not completely turning the water over evenly throughout the tank. An internal power filter can fill in those gaps, so you can be sure the tanks water is fully turned over. 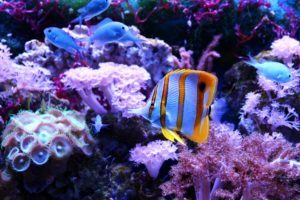 Internal power filters do have their strengths and weaknesses, but they can be can be leveraged to your advantage in a wide range of aquariums. Another filtration method usually reserved for smaller tanks is a sponge filter. Sponge filters use air to pull water through a sponge, which results in surprisingly efficient mechanical and biological filtration. 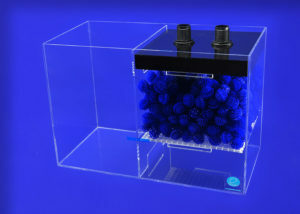 Since an air pump provides the force necessary for the filter, a separate air pump might be needed to get maximum benefit from a sponge filter. The mechanical filtration provided by a sponge filter, is mainly limited by the power of the air pump driving the filter. This can make a sponge filter less efficient than most other filters. In small tanks with minimal bio-load this level of mechanical filtration can be more than adequate. Mechanical filtration can also be hampered by any detritus clogging the sponge. If this happens it can limit the sponges ability to remove particles from the water. In order to avoid this problem regular maintenance will be needed. Cleaning the sponge will ensure water continues to cycle smoothly through all of its pores. Biological filtration is adequate in most sponge filters, since the bacteria have a large surface area inside the sponge to colonize. But since the sponge filter is completely submerged the bacteria will have less access to oxygen. The low oxygen issue is somewhat countered by the fact that the air bubbles from the air pump are in close proximity to the sponge. Those air bubbles can deliver a good dose of oxygen to the bacteria inside the sponge. One other thing to be aware of is not to damage the bacteria when cleaning a sponge filter. The best way to clean a sponge filter, is to squeeze out any debris in a bucket filled with water taken from the aquarium. By cleaning a sponge filter this way you will not be exposing the filter to any chlorine that can kill off the bacteria. 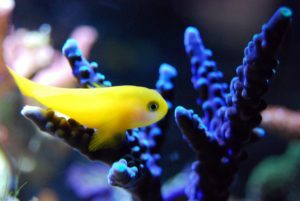 The main use for a sponge filter is for fish that can’t handle turbulent water, or fish that might get sucked into other filtration systems. They are great for breeding tanks, and will help keep fry mortality to a minimum. Another reason to add a sponge filter is to decrease dead zones, and increase oxygen in the water. And if you see waste build up in the corners of the tank you might want to try adding a sponge filter. 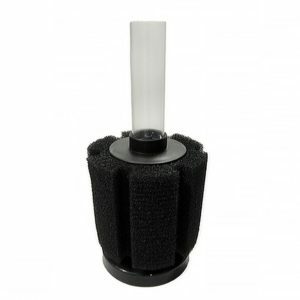 Sponge filters are affordable and widely available, and they come in a wide range of sizes, so finding one that is suitable for your tank should be easy. Under gravel filters are another form of internal filter. They use a large grated plate that covers the entire bottom of the aquarium. The plate is then covered with gravel which acts as the filtration media. Water circulation is handled by an air pump, which is connected to uplift tubes that create a siphon effect and draw water through the gravel. Mechanical filtration happens when particles get trapped in the voids of the gravel substrate. While this method of mechanical filtration will work, it is not as efficient as floss or foam filters. Trapping all the particulate in the gravel can also cause problems in the long run. Manually cleaning the gravel will be very important in order to prevent clogging of the substrate. And the build up of detritus can release toxic byproducts that can cause the aquariums inhabitants harm. Chemical filtration is usually not provided by most under gravel filters. This means in most cases that any chemical filtration will have to be provided by a supplemental filter. 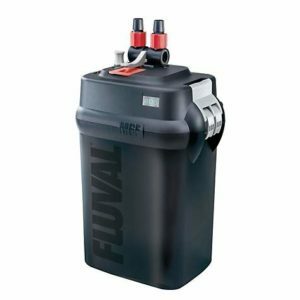 Some newer models of under gravel filter do include activated carbon cartridges, but these are not as readily available in most stores. If you need chemical filtration be sure to find a model that offers this option. Biological filtration also relies completely on the gravel. Gravel usually has a large surface area for the bacteria to colonize. Though it’s important to remember that bacterial colonization will be totally dependent on the type of gravel. Smooth gravel that is less porous will have much less surface area for the bacteria to colonize. Another limitation of using gravel for biological filtration is the limited oxygen available. The deeper levels of the gravel will most likely have anoxic conditions. And any location that has objects that obstruct the surface of the gravel will limit the flow of water. Those obstructions will make those areas dead spots in the under gravel filter. For optimal performance keep the gravel clean and level. And make sure it is unobstructed, so the gravel filter will work at its peak efficiency. One type of aquarium setup where an under gravel filter should not be used is in a planted tank. If an under gravel filter is used in a planted tank you run the risk of the roots clogging the filter. And the added debris present in a planted tank can also stop up the filter. 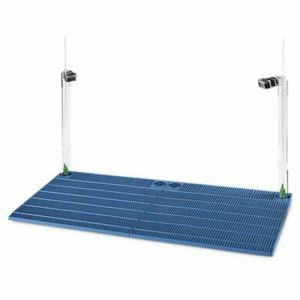 Under gravel filters are a good low price option for small starter aquariums. If you have a very small aquarium then an under gravel filter can be a good option, since it will not monopolize valuable tank real estate. If you decide to use an under gravel filter, just be sure to clean the gravel on a regular basis to keep the filter working at its peak performance.